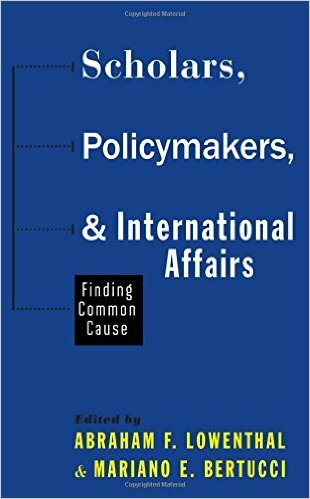 Scholars, Policymakers and International Affairs: Finding Common Cause (co-edited with Abraham F. Lowenthal) (Baltimore, Md. : Johns Hopkins University Press, 2014) view the book on Amazon. Inside Higher Ed read article. Toward Best Practices in Scholar-Practitioner Relations: Insights from the field of Inter-American Affairs International Studies Perspectives Vol. 15, Issue 1 (Feb. 2014). (With Fabián Borges-Herrero and Claudia Fuentes-Julio) read article. Scholarly Research on U.S.-Latin American Relations: Where Does the Field Stand? Latin American Politics and Society Vol. 55, Nº 4 (Winter 2013) read article. Política Externa (Brazil) read article (in Portuguese). Transforming Argentine Foreign Policy: Politicians, Scholars and Diplomats, in Abraham F. Lowenthal and Mariano E. Bertucci (eds. ), Scholars, Policymakers and International Affairs: Finding Common Cause (Baltimore, Md. : Johns Hopkins University Press, 2014). Scholars, Policymakers and International Affairs: Learning from Experience (with Abraham F. Lowenthal), in Abraham F. Lowenthal and Mariano E. Bertucci (eds. ), Scholars, Policymakers and International Affairs: Finding Common Cause (Baltimore, Md. : Johns Hopkins University Press, 2014). Rapprochement Reconsidered Latin American Politics and Society (forthcoming). Latin America’s New Era of Regionalism Americas Quarterly (Winter 2015): 144-146 read article.